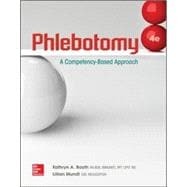 Competency is within your reach with the new, fourth edition of Phlebotomy: A Competency-Based Approach. With Phlebotomy’s pedagogy-rich format and plentiful Competency Checks, easily grasp not only essential phlebotomy skills and competencies, but also the critical soft skills needed for a successful transition from classroom to lab. Phlebotomy is also now available with McGraw-Hill Education’s revolutionary adaptive learning technology, LearnSmart and SmartBook! You can study smarter, spending your valuable time on topics you don’t know and less time on the topics you have already mastered. Access these new adaptive study tools through a revised Connect Plus, McGraw-Hill Education’s online assignment and assessment platform. Hit your target with precision using LearnSmart, SmartBook, and Connect Plus…Join the learning revolution and achieve the success you deserve today!